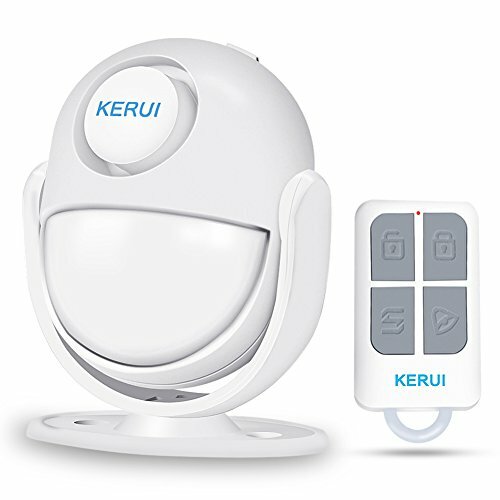 Why choose KERUI P6 infrared Motion Detector alarm? These features you may not find in any other products. ①High-end infrared detection technology,More accurate and reliable. ②Anti-theft or welcome mode,Widely apply in home,store,business office and driveway. ④Wide communication to keep you informed and ensure safety. for you to enjoy a security life. HIGH-TECH:KERUI P6 infrared motion detector adopt advance digital analysis processing,with high detecting and anti-false alarm function. It will chime immediately with LED indicator when visitor enter into the detecting area . TWO MODES:Welcome doorbell mode and Anti-theft mode,When gusts come in,it will make ding-dong greeting voice,it is perfect for your store,apartment ,business office.When theft move to the area, it will alarm .Your can change the mode by remote controller. REASONABLE KEY DESIGN:Motion detection Range of the infrared sensor 16-26ft,loud ring volume 125dB to keep you informed and ensure safety,You can choose different modes,and also can open or close it by the key.It's very convenient.There are two way to power the device battery and charger adapter. MULTI- EASY INSTALLATION: With its simple double-sided tape ，powered by 3 AAA batteries(come with package) or charge adapter (without).Really DIY installation , you can choose simple or screw way to install it . Battery or adapter cable power . WHAT YOU GET:"1*p6 host ,1*remote control, 1*set stickers 2*screws,3*batteries ,1*user manual .100% quality & service , 3 year manufacturer's warranty.